Gestational dormitories. Routine C-sections. Quintuple embryo implants. Brave New World? Nope, surrogacy tourism. ON A QUIET STREET about a mile from the clinic, a government ration shop issues subsidized rice to an endless stream of impoverished clients. Across the road is a squat concrete bungalow enclosed by concrete walls, barbed wire, and an iron gate. Police once used the site as a storehouse for bootleg liquor captured in Eliot Ness-style raids. (Like the rest of India’s Gujarat state, Anand is a dry city.) The security measures were intended to keep away bootleggers who might be tempted to reclaim the evidence. Now the building functions as one of two residential units for Akanksha’s surrogates. The women—all married and with at least one previous child—have traded the comforts of home to enroll as laborers in India’s burgeoning medical tourism industry. Most will spend their entire pregnancies living in this building. In exchange for the inconvenience and physical discomforts, they stand to receive a sum that’s quite substantial by their meager standards, but which the clinic’s customers understand is a steal. The customers are mostly foreigners—three of the city’s boardinghouses are constantly booked with American, British, French, Japanese, and Israeli surrogacy tourists. After a few minutes of recon, I cross the street to the bungalow, where a friendly smile gets me past the gatekeeper. In the hostel’s main living quarters, some 20 nightgown-clad women in various stages of pregnancy lie about, conversing in a hurried mix of Gujarati, Hindi, and a bit of English. A lazy ceiling fan stirs the stagnant air, and a TV in the corner—the only visible source of entertainment—broadcasts Gujarati soaps. The classroom-size space is dominated by a maze of iron cots that spills out into a hallway and additional rooms upstairs. It is remarkably uncluttered given the number of people living here—each surrogate has only a few personal belongings, perhaps enough to fill a child’s knapsack. In a well-stocked kitchen down the hall, an attendant who doubles as the house nurse prepares a midday meal of curried vegetables and flatbread. The women are pleasantly surprised to see me. It’s rare, one tells me, for a white person to show up here. The clinic discourages personal relationships between clients and surrogates, which according to several people I talked with makes things easier when it comes time to hand over the baby. Through an interpreter, I tell the women that I’m here to learn more about how they live. Diksha, a bright, enthusiastic woman in her first trimester, elects herself spokeswoman, explaining that she used to be a nurse at the clinic. She left her home in neighboring Nepal to find work in Anand, leaving her two school-age children behind. She’ll use the money she makes to fund their education. “We miss our families, but we also realize that by being here we give a family to a woman who wants one,” Diksha says. She and her dormmates are paid $50 a month, she says, plus $500 at the end of each trimester, and the balance upon delivery. All told, a successful Akanksha surrogate makes between $5,000 and $6,000—a bit more if she bears twins. If a woman miscarries, she keeps what she’s been paid up to that point. But should she choose to abort—an option the contract allows—she must reimburse the clinic and the client for all expenses. No clinic I spoke with could recall a surrogate going that route. Among the justifications for cloistering the surrogates—Akanksha isn’t the only clinic doing it—is to facilitate medical monitoring and provide the women better living conditions than they might have back home. For their part, the women tell me their condition would almost certainly make them the subject of village gossip. Even so, those who have been on the ward longer than Diksha don’t seem terribly thrilled with the whole setup. I sit down next to Bhavna, far along and bulging in her pink nightgown, with a gold locket around her neck. She looks older than the rest—tired. It’s her second surrogacy here, she tells me. Apart from occasional medical checkups, she hasn’t left this building in nearly three months, nor had any visitors. But $5,000 is more than she would make in years of ordinary labor. Mostly she just looks forward to collecting her check and being done with it. Dependable numbers are hard to come by, but at minimum Indian surrogacy services now attract hundreds of Western clients each year. 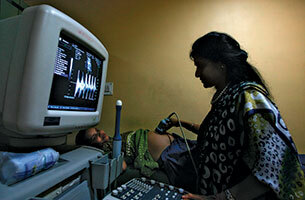 Since 2004, Akanksha alone has ushered more than 232 babies into the world through surrogates. By 2008, it had 45 surrogates on the payroll, and Patel reports that at least three women approach her clinic every day hoping to become one. There are at least 350 other fertility clinics around India, although it’s difficult to say how many offer surrogacy services since the government doesn’t track the industry. Mumbai’s Hiranandani Hospital, which boasts a sizable surrogacy program, trains outside fertility doctors to identify and recruit promising candidates. The Confederation of Indian Industry predicts that medical tourism, including surrogacy, could generate $2.3 billion in annual revenue by 2012. “Surrogacy is the new adoption,” says Delhi fertility doctor Anoop Gupta. Last May, for instance, a young surrogate named Easwari died after giving birth at the Ishwarya Fertility Clinic in the city of Coimbatore. A year earlier, her husband, Murugan, had seen an ad calling for surrogates and asked her to sign up to earn the family extra money. As a second wife, Easwari was hard-pressed to refuse. The pregnancy went smoothly and she gave birth to a healthy child. But Easwari began bleeding heavily afterward, and the clinic was unprepared for complications. Unable to stop Easwari’s hemorrhaging, clinic officials told Murugan to book his own ambulance to a nearby hospital. Easwari died en route. That’s all he has to offer on the topic. “Perhaps you should talk to my boss,” Avasia says. Alas, the boss won’t return my calls. There hasn’t been any effort to regulate surrogacy contracts on the receiving end, either. So long as a surrogate infant has an exit permit from the Indian government, the process for getting the baby an American passport is straightforward. I met Sarah (a pseudonym, per her request) in the hallways of the Laksh Hotel, which caters to Akanksha’s surrogacy tourists. For many, this India excursion represents the final stage of an expensive and emotional quest for genetic parenthood—their last option after a series of failed fertility treatments. She tried for years to conceive, and after extensive testing was told she never would. Adoption didn’t appeal to her. Then she read a news article about Patel and knew immediately that she wanted to come to Anand. “Money was definitely one of the reasons, but it was like my gut feeling,” she says. “This is where I needed to be.” Sarah and her husband resolved to keep their undertaking secret from friends and neighbors—at least until they returned home with a baby. Then how to view it? Oprah showcased Jennifer and Kendall, a childless couple who had tried everything else but couldn’t afford the American surrogacy system. With Patel’s help, Jennifer became a mom, and an Indian woman was lifted from poverty—a transaction part business and part sisterhood. Yet it’s a setup fraught with all the ambiguities of the global labor market: When you buy sweatshop sneakers it allows someone’s family to eat. But you also know you’re getting a bargain only because the people making the shoes are poor. Clinics work hard to present surrogacy—to surrogates and clients alike—as an act of altruism, and insist that the women offer their wombs out of a sense of communal responsibility, not simply because they need a paycheck. The boilerplate contracts Akanksha has its clients and surrogates sign are correspondingly vague about the nature of the service being provided. Besides India, only a handful of countries—including the United States, Ukraine, Thailand, Israel, and Georgia—allow surrogacy for pay, and most of those have imposed strict regulations. France, Greece, Japan, and the Netherlands forbid even unpaid arrangements, and no country, not even India, recognizes surrogacy as a legitimate form of employment. America leaves regulation to the states: Eight recognize and support it and have mandated health safeguards and counseling for surrogates. Three, plus the District of Columbia, have banned it outright. And the rest have either deemed surrogacy contracts unenforceable, left surrogacy for the courts to deal with through case law, or simply ignored the practice. India’s Council of Medical Research (which plays an FDA-like role) has come up with proposed surrogacy guidelines that caution against some practices already in common use in Anand and elsewhere, such as allowing the clinics to broker surrogacy transactions. But these nonbinding rules, considered a starting point for national legislation, ignore other glaring ethical issues, such as whether it’s okay to impose C-sections on a surrogate or, for that matter, make them live in a group dormitory for nine months. Doctor Anoop Gupta does things a bit differently. He runs Delhi IVF, the clinic where I met Kristen Jordan, and where his waiting room is packed with chatty patients. Next to Akanksha’s spartan vibe, it is night and day, with wood-paneled walls and a brightly lit aquarium exuding a sense of security and warmth usually lacking in Indian medical facilities. Clad in green scrubs and a blue hairnet, Gupta is constantly on the move and has little time for questions. Instead, he has me observe a constant stream of patients who have come to him from as far away as Ireland and California, or from as close as a few blocks away. While most are here for routine fertility treatments, Gupta has at least seven surrogates on the rolls this month. “In India the government makes it difficult to arrange an adoption, while having your own genetic child through a surrogate is legal and easy,” the doctor says as he slathers a clear gel on the paddles of an ultrasound machine. The only hurdle, as he sees it, is finding a surrogate who isn’t motivated by desperation. One of Jindal’s recruits, a 32-year-old social worker named Sanju Rana, is here for her ultrasound. Unlike the Anand surrogates, she is college educated and plans to work full time throughout her pregnancy. She’s been promised $7,500 for her services, and has Gupta’s direct phone number. During the procedure, Rana, already a mother of two, is surprised to learn that she is carrying twins for an American couple. She’s worried, she tells me, but she will most likely carry them to term. “They are good people, and have been childless for so long,” Rana says. SARAH IS CHILDLESS no longer. It took five weeks to finalize her newborn’s status as a United States citizen, complete with a shiny blue-and-silver passport and a no-objection certificate issued by the Indian government. But she has since traded the smog and chaos of Anand for her quiet neighborhood in North Berkeley, where the realities of motherhood have kicked in. Sarah says she was surprised when Patel offered her a choice of birthdays. But she chose, and then waited expectantly while the clinic delivered Zoe via C-section. “There was an intensity in her eyes,” Sarah recalls of the handover. “It was hard for her, and you could see how much she cared for Zoe.” In the end, though, the baby had to come home with her mother. Correction: Sarah had been back in Anand just a few days when she first met the reporter, not three weeks; she later visited with Saroj, the surrogate mother.